We try to give our customers (who are awesome) useful gifts for their effort. 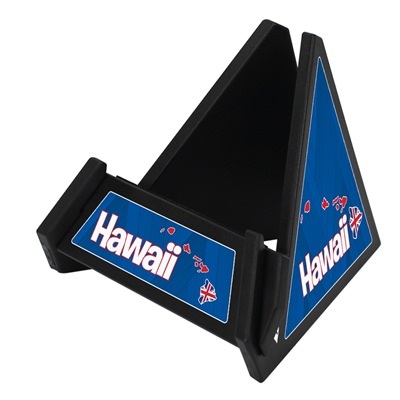 With your qualifying purchase, please accept this great Black Hawaii Islands phone stand! A fantastic one-of-a-kind mobile accessory, this multifunctional gift helps you put your digital media into perspective! This sturdy stand assembles in seconds, no tools required. Use it for your phone or tablet. Nothing will obstruct your charging cables either! Your mobile devices are in safe hands, too; this phone stand has rubber grips to ensure the stand will not movie. Enjoy!